Within an hour’s drive you’ll find world class hiking, biking, fishing and bouldering, and thanks to Abingdon’s numerous guide and shuttle services, you can easily get on the trail and back to Abingdon in plenty of time to enjoy the innovative restaurant scene and relaxed nightlife. Visitors come from all over the world to ride The Virginia Creeper Trail, a bucket-list recreation trail that starts in Abingdon and travels 34.3 miles through the pristine scenery of Jefferson National Forest, traveling over babbling streams and trestle bridges. The trail runs along a railroad right-of-way that dates back to the 1880s. Today, it is widely considered one of the finest rails-to-trails examples on the east coast. One of the most appealing things about the Creeper Trail is how accessible it is for riders of all ages. Rent a bike from The Virginia Creeper Trail Bike Shop and take a shuttle to the highest point at Whitetop Station, then cruise downhill for almost 17 miles to the tiny trail town of Damascus, VA.
Request a shuttle pickup at the bottom of the mountain, or continue your ride another 17 miles to Abingdon through tranquil farmlands and over 19th Century trestle bridges. Stop by Abingdon Vineyard & Winery, a 50-acre farm winery with picturesque views of the South Holston River. Your shuttle will return you to Abingdon in plenty of time for dinner at one of Abingdon 35 independently owned restaurants, offering selections from traditional southern fare to innovative international flavors. Abingdon’s most famous eatery is The Tavern, located in a moss-covered building dating back to 1779. Complete your day with a performance at the famous Barter Theatre. When it first opened its doors during the Great Depression, patrons could buy a ticket by bartering produce or livestock. The theatre launched the careers of stars like Gregory Peck, Patricia Neal, Ernest Borgnine, and Ned Beatty. Eight decades later, this professional theatre performs year-round in two unique venues. Mount Rogers National Recreation Area is home to the Virginia Creeper Trail. The mountaintop maze of The Great Channels is like no place else in Virginia. Fuel up for another day of adventure at White Birch Food & Juice, a locally-focused restaurant serving up farm-fresh breakfast and cold-pressed raw juices. Pack a picnic lunch prepared by Amy’s Idle-In-Café, and head for a hike to The Great Channels, one of Virginia’s best-kept secrets and most singular natural wonders. Located in the heart of the vast state forest, in the designated 721-acre Channels Natural Area Preserve , the Great Channels are a 20-acre labyrinth of sandstone formed during the last ice age, stashed away along the 4,208-foot crest of Middle Knob, the high point of Clinch Mountain. The Channels feel almost otherworldly, but they are only an hour drive and a 3-mile hike from downtown Abingdon. Pick up a map at the Abingdon Visitor Center, or work with a guide service like Feeld Trips for door-to-door service and insider tips from the locals. After your hike, spend the afternoon with a lazy float of your choice. For those who want a truly decadent experience, check in to the Spa at The Martha Washington Inn, and enjoy a therapeutic float in the indoor saltwater pool, followed by a massage and a glass of wine in the secluded, stone-lined hot tub. If you prefer nature therapy, try a float of another kind with a mellow kayaking trip through Adventure Mendota. 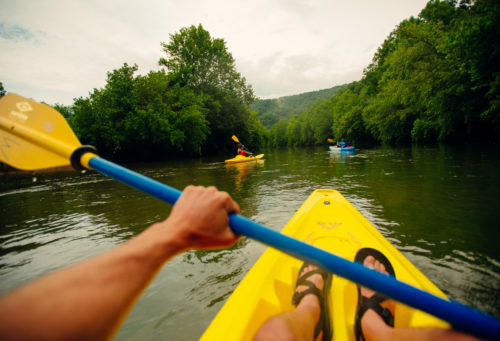 They offer guided or unguided kayak trips down the North Fork of the Holston River. This Class I/Class II river is perfect for recreational kayaking; the water's gentle flow is appealing to all skill levels. Wrap up your day by enjoying some live music in downtown Abingdon. Bonefire Smokehouse offers delicious smoked meats and unique southern high country sides, with music on stage three nights a week. Wolf Hills Brewing Company keeps a rotating list of at least 7 seasonal brews on tap, plus live music and a perennially popular karaoke night. Make sure to pack your camera when you head to Grayson Highlands State Park, just an hour from Abingdon. 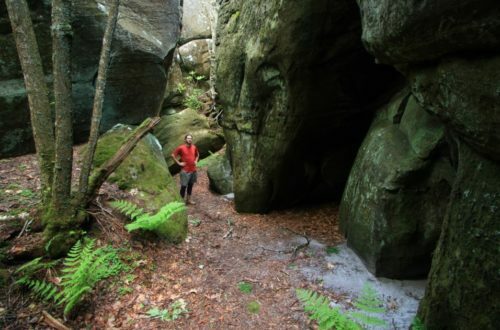 Spread over a pocket of Appalachian high country, this state park is an alpine Eden. The lofty landscape is embellished by airy mountain meadows, gushing trout streams, rhododendron-filled forests, and a conglomeration of high peaks. 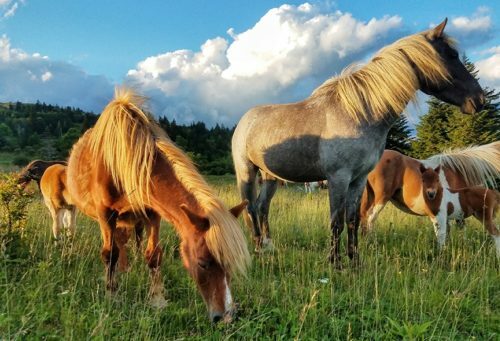 One of the park’s highlights is the band of ponies roving the highlands—including a famous, flaxen-maned stallion named Fabio, renowned for his salon-quality locks. The easily accessible Rhododendron Trail is a 2.5-mile loop with sweeping views of Wilbur Ridge and Mount Rogers, the highest peak in Virginia. Grayson Highlands is not just a bucket-list trip for hikers in the Old Dominion—the park is also one of the premier bouldering destinations in Virginia. As you wrap up your visit, stop by Heartwood in Abingdon for a sampling of the best music, food and crafts of Southwest Virginia. Pick up a souvenir from the makers-only gift shop, and research your next outdoor adventure in the 19 counties of Southwest Virginia. Wild ponies graze on the alpine balds of Grayson Highlands State Park. Photo by Bob Diller.